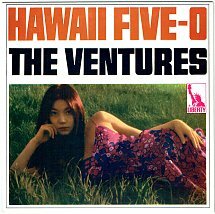 1969 Song of the Day- Hawaii 5-0- The Ventures. From the instrumental album of the same name- this instrumental is of course the theme song of the long running Hawaii 50 television program which ran from 1968-1980 starring Jack Lord and James MacArthur. I was never a fan of the show- I didn’t dislike it I just wasn’t interested in it- but of course I did hear this theme song and I knew ‘Book’em Dan-O.” The album went to #11 on the album chart- and Hawaii 5-0 the single went all the way to #4. A great television theme song. It was The Ventures 6th and final Top 40 hit. I think that was the thing with me when it came on I was 7-8- too young for that show and yes what would police do in Hawaii? Ocean paradise- certainly no crime right!! Oh, MAN! This song gives me chills everytime I hear it. Badass song. I like all three versions of it. Grew up listening to The Ventures & watching Hawaii 5-0 (and every cop show in existence thanks to my dad).